The next installment of our Cold Weather Gear Guides is for the rider who isn't planning any 8,000-mile adventure rides for the winter and doesn't plan to be hitting the off-road trails either. This gear will perform well for the urban commuter or the casual everyday rider looking to stay warm. It also offers a subtle look that will be stylish on the bike or wandering around the streets of the city. All of the gear in this video will be built for Fall-Winter-Spring riding, featuring water-resistance and thermal liners. Be sure not to miss our other guides which feature our picks for Sport, Touring & ADV cold weather riding if any of those is more your style. In this guide we feature outfits from REV'IT!, Icon, Firstgear & Alpinestars. Starting out, we have an outfit from Alpinestars that will perform well in the cool and cold weather, and completely shield you from precipitation. 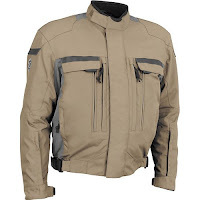 The Alpinestars Verona WP Jacket & Alpinestars P1 Sport Touring Drystar Pants have a great muted style that will make it difficult for people to even know you were riding a motorcycle. The jacket and pants are constructed with 450D & 500D Cordura for durability and weather resistance and feature CE rated armor in the shoulders, elbows and knees. The jacket has a PU coating on the exterior to assist the built-in waterproof membrane in ensuring you'll stay dry while riding. 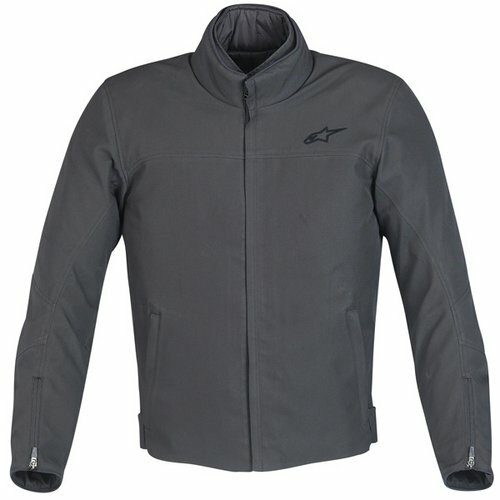 Alpinestars' minimalist styling of the jacket makes it an ideal choice for anyone wishing to fly under the radar. The pants are form-fitting and contoured, providing an ergonomic sport fit that is not bulky at all. 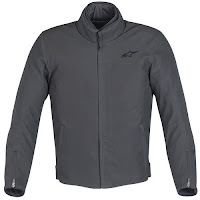 This is an excellent option from Alpinestars, who always delivers on style and performance. The REV'IT! CR Textile Jacket & REV'IT! Zip Pants is one of a few featured REV'IT! outfits in this lineup. Previously seen in our Sport Riding gear guide, the REV'IT! 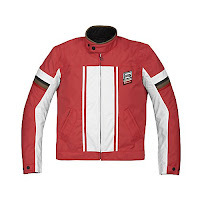 CR Textile Jacket provides a vintage style that will appeal to any classic-type of rider. Moto Guzzi riders, cafe racers, light motorcyclists, scooter riders: that's who REV'IT! made this jacket for. With bold racing stripes on the chest, arms, and back, the CR jacket also has Knox CE rated armor in the shoulders and elbows with a detachable thermal vest liner to keep you insulated in the cold. The Zip pants offer the same Knox CE armor but also have a Hydralining waterproof breathable membrane to keep your legs free from precipitation. They built this overpant specifically for the everyday rider as it fits conveniently over jeans or business wear. A great option from REVIT that corners the niche of riders that rock the vintage look. 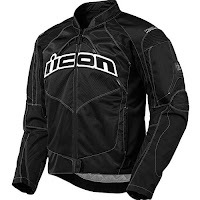 Changing gears and moving into something a bit more in-your-face, the Icon Contra Slate Jacket & Icon Arc Textile Pants are a great choice for the everyday sportbike rider in the winter time. We showed off the Icon Contra Redeemer Jacket in our sport riding video in addition to the Arc pants in a different pairing. Removable CE rated armor in the shoulders, elbows and knees and a durable textile chassis with heavyweight reinforcement panels ensure your safety from abrasion and impact in this combo. Both jacket and pants are water-resistant so this won't be ideal for very rainy conditions. But for basic everyday riding in the cold, this outfit is going to perform tremendously. 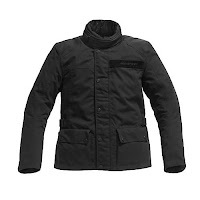 The Firstgear Kenya Jacket and brand new for Fall 2010 Firstgear HT Overpants is one of the most versatile options in this lineup. It'll do a great job in the cold, but also perform well as the mercury begins to rise. Both jacket and pants are built with 600D polyester and have Firstgear's proprietary Hypertex waterproof breathable membrane. CE rated armor exists in the shoulders, elbows and knees. The jacket has a fully-sleeved removable insulated liner and the pants, designed as overpants, also have a zip-out thermal liner pant that can be worn standalone. The HT Overpants are completely redesigned over previous models with greatly upgraded articulation and fit. This is a do-it-all three to four season outfit from Firstgear that will offer superb performance in the cold and wet months. We also highlight these pants with the Firstgear Kilimanjaro Jacket later in this guide. The Kilimanjaro is waterproof breathable with CE rated armor, and an excellent ventilation scheme for true four-season riding. The REV'IT! Dragon Jacket & REV'IT! Factor Pants are another four-season riding option. This combo will absolutely shine in the Fall, Winter & Spring but will also perform in the hotter months of the year, with removable liners and excellent ventilation. The pants have REV'IT! 's Hydralining (waterproof & breathable) sandwiched into the outershell and the jacket has a detachable Hydratex liner that is waterproof breathable as well and can be worn standalone. With a durable construction of high deniers including 600D polyester, 750D PWRShell & 1000D Cordura, this outfit is going to keep you toasty and dry all through the year. 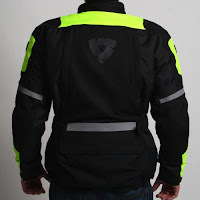 The jacket is also available in hi-vis, with bright yellow accents that is an excellent choice for the commuter. Both the pants and jacket are available in womens-specific sizing and fit, the REV'IT! Siren Jacket being the womens version. Lastly, the REV'IT! Brighton Jacket & REV'IT! Factor Pants combo may seem familiar to anyone who has seen our Sport Riding gear guide. That's because the Brighton is essentially the slightly longer version of the REV'IT! Bronx Jacket. This outfit looks great zipping around town or hopping off the bike and walking. I've already spoken at length about the Factor pants so I'll focus on the jacket. Constructed with a highly water-repellent fabric and providing a removable thermal liner, the Brighton will keep you warm and dry. It also offers the versatility of a removable thermal collar for the warmer days of the season. Simply put, this is a great choice for the urban rider: protective, understated, stylish. That'll do it for our seven picks for Everyday Winter Riding. Don't miss all of our Cold Weather Motorcycle Gear Guides at RevZilla.com. Keep it warm, dry, and safe in the winter!